It’s natural to experience aches and pains as we get older, but it becomes an issue when these aches and pains start to affect our daily activities. The sternum—also referred to as the breastbone and chest bone—is a bone located in the central area of your chest, below your collarbone. People over the age of 50, women and the elderly in particular, have a higher risk of developing sternal pain and fractures. Sternum pain is typically associated with clicking or cracking sensations in your sternum bone. Although a bruised sternum can be associated with cardiac-related chest pains, it doesn’t mean that it is related to a cardiovascular disease. 1. Sternum fractures: This happens when there is a fracture to the breastbone, typically a result of physical trauma (i.e. being hit with a large object). Treatment: Make sure to see your doctor for a physical, as surgery may be necessary if the bones are out of place. Get lots of rest and refrain from conducting heavy labor until the area has healed. Apply ice packs to the fractured area for 20-minute intervals every two or three hours for the first few days until swelling decreases. 2. Sternum inflammation: You will likely feel tenderness or pain when you touch the rib joints and sternum—the pain will likely increase when you breathe and move around. Treatment: Compress the tender area with ice, which will help reduce the swelling. 3. 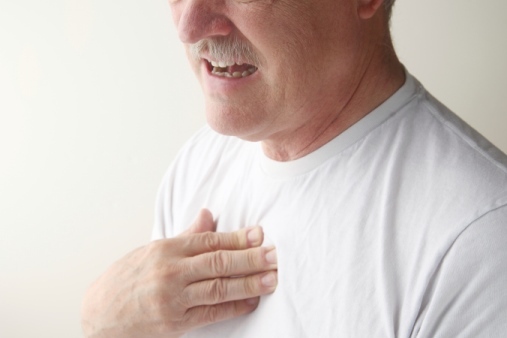 Heartburn: The burning chest pain occurs more frequently after a person finishes a large meal, especially when a person consumes their food too quickly. Pain can occur when you are attempting to bend over and can transfer to the sternum if not treated immediately. Treatment: Taking antacids will help neutralize the acid in your stomach and relieve the pain. For a more natural remedy, try mixing one teaspoon of baking soda with a glass of water—since baking soda has a pH higher than seven, it can neutralize stomach acid and soothe the burning sensation. 4. Collarbone trauma: The collarbone can be found at the top of your chest, and this trauma tends to occur at birth or after a fall. The pain can be transferred to the sternum. Treatment: Visit your doctor immediately after a collarbone trauma for diagnosis and treatment. You will likely have to wear a sling—it wraps around the shoulders and neck area to hold the shoulders up. The sling is typically worn for four to eight weeks. 5. Costochondritis: You will experience tenderness and inflammation where the ribs and cartilage meet. Chest pain and sharp pains under rib cage or the front of your chest will typically get worse whenever you take deep breaths or cough. Treatment: By simply applying heat or ice to the tender area, you can relieve the inflammation. Avoid heavy labor and contact sports until symptoms improve. 6. Pleurisy: The symptoms are similar to costochondritis—each cough and each breathe will cause pain that is caused by inflammation of the inner walls of the chest. Treatment: Get lots of rest; and as strange as it may seem, lie down on the side of the chest that is causing you the most pain. It’s worth it to note that treatment solely depends on the root of the cause. For instance, if the pain is caused by pneumonia or a bacterial infection, antibiotics will be recommended by your physician. 7. Sternoclavicular joint injury: Any dislocation to the sternoclavicular joints may eventually cause pain to the sternum. Treatment: Depending on the severity of the injury, your doctor may wrap you in a sling; ice can also be used to soothe the pain. Refrain from any physical activity or contact sports to avoid aggravating your injury. Remember to set up an appointment with your doctor immediately following any sort of physical trauma. “Sternum Pain,” New Health Guide web site; http://www.newhealthguide.org/Sternum-Pain.html, last accessed June 3, 2015. Guthrie, K., “Sternal Fractures,” Life in the Fast Lane web site; http://lifeinthefastlane.com/sternal-fractures/, last accessed June 3, 2015. “15 Natural Remedies for Heartburn & Severe Acid Reflux,” EverydayRoots web site; http://everydayroots.com/heartburn-remedies, last accessed June 3, 2015. “Broken Collarbone,” eMedicineHealth web site; http://www.emedicinehealth.com/broken_collarbone/page7_em.htm, last accessed June 3, 2015. Perkins, S., “What Are the Treatments for a Broken Sternum?” Livestrong.com, May 8, 2015; http://www.livestrong.com/article/254691-what-are-the-treatments-for-a-broken-sternum/. “Costochondritis,” WebMD web site; http://www.webmd.com/pain-management/costochondritis?print=true#1, last accessed June 3, 2015.